Land Rover Series 111 88"
In pale green with a black vinyl interior. This two owner Series 111 started life with a horrid two and a quarter diesel engine. When that died, our local independent Land Rover specialists, AHL Land Rover, fitted a tuned 2.25 petrol engine from one of their own cars that they used to use in trials. It has a skimmed 2.5 litre cylinder head, it's polished and ported and is very carefully put together and goes like a train. The truck has a comprehensive history back to new including MOTs back to 1987 to verify its 69,000 miles, the original Dealer pack and a log of its early history, and has been maintained by AHL for the last fifteen years. Works include a new rear crossmember, and outrigger and recent new brakes. 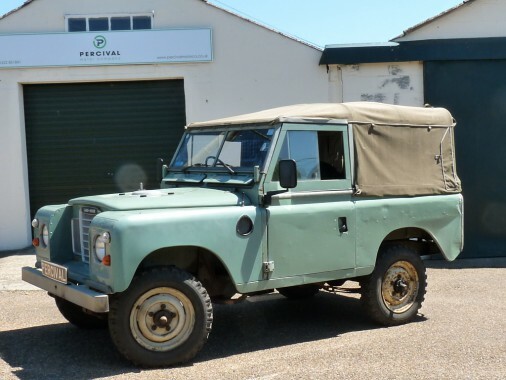 The last owner, a classic car enthusiast with some serious cars, has ensured that the Land Rover is kept mechanically and structurally excellent. The body is delightfully dented - the car started life on a farm and is in lightly battered countryside condition. The interior is clean and lightly worn. The bulkhead area is excellent with a small repair to the footwell. The underside is dry and a wire brush and a Waxoyl wouldn't go amiss. The Land Rover is one of the nicest Series 111s we've driven. The engine is a honey and the car has nicely mellowed feeling about it.